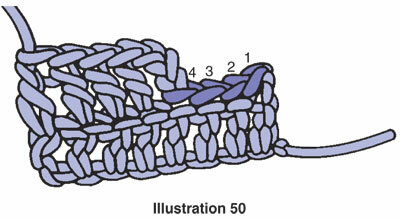 The slip stitch is the shortest of all crochet stitches and is really more a technique than a stitch. 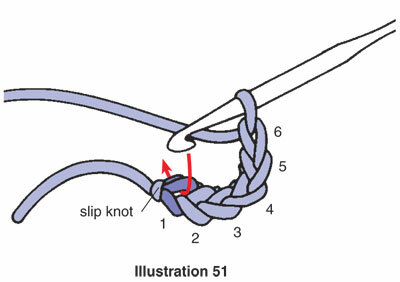 Slip stitches are usually used to move yarn across a group of stitches without adding height, or they may be used to join work when working in rounds. 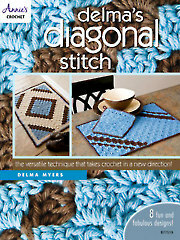 First we will demonstrate how to use the slip stitch to move yarn across stitches. We will begin by chaining 10. Row 1: To work row 1, we will be using the double crochet stitch and will double crochet in the fourth chain from the crochet hook and in each chain across. 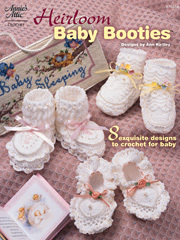 To begin the double crochet, yarn over the hook from back to front, insert the hook in the fourth chain from hook, yarn over again and draw it through the chain stitch and up onto the working area of the hook; you should have three loops on the hook. Yarn over and draw though the first two loops on the hook. You now have two loops on the hook. Yarn over and draw through both loops on the hook. One double crochet is completed and six more to go. Turn work. 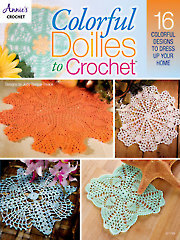 On the next row, you are going to slip stitch across the first four stitches before beginning to work double crochet again. Row 2: To work row 2, instead of making three chains for the turning chain as you would usually do for a second row of double crochet, this time just chain one. 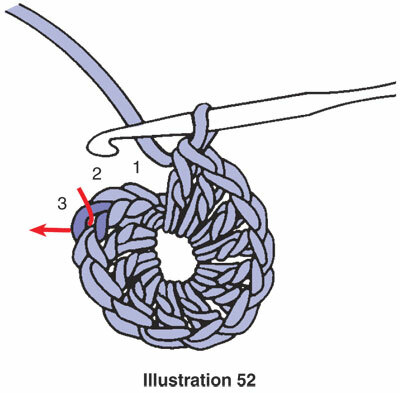 The turning chain-one does not count as a stitch; therefore, insert the crochet hook under both loops of the first stitch, yarn over and draw the yarn through both loops of the stitch and loop on the hook (see illustration 49); one slip stitch made. 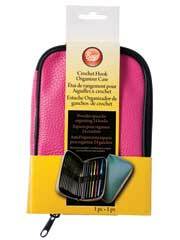 We will now work a slip stitch in the same manner in each of the next three stitches. Now we’re going to finish the row in double crochet; first you will chain 3 to get yarn at the right height (the chain 3 counts as a double crochet), then work a double crochet in each of the remaining stitches. 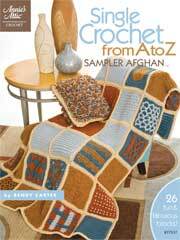 You can see that we moved the yarn across with slip stitches and added very little height (see illustration 50). 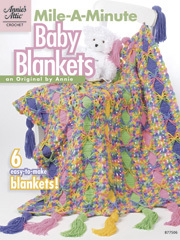 Next, we will demonstrate how to use a slip stitch to join a chain into a circle. 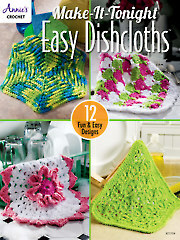 Knowing how to join a chain into a circle is important as it is the way many hats and motifs, such as granny squares, are started. We will begin by chaining 6. 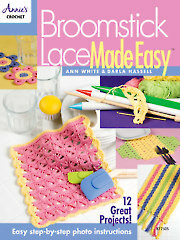 Next, you will insert the crochet hook through the first chain you made which is next to the slip knot (see illustration 51). Yarn over and draw it through the chain and through the loop on hook; you have now joined six chains into a circle or a ring. Next, we will demonstrate how use a slip stitch to join the end of one round to the beginning of the same round. We will begin by chaining 6. 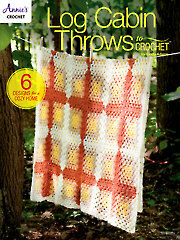 Next, you will join the chain 6 with a slip stitch in the first chain you made to form the ring. We will now chain 3, and will then work 11 double crochet into the center of the ring. 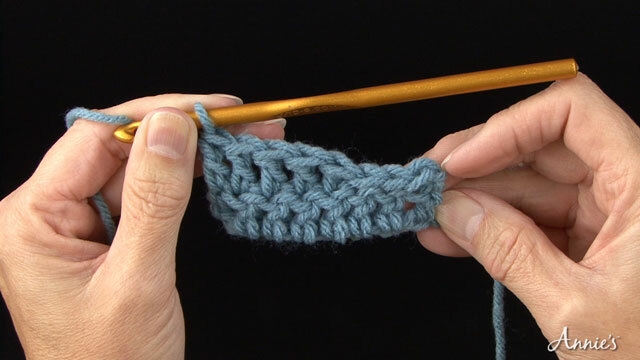 To double crochet, first bring yarn over the crochet hook from back to front, then insert the crochet hook in the middle of the ring; yarn over again and draw it through the loop and up onto the working area of the hook. You now have three loops on the hook. Yarn over and draw through the first two loops on the crochet hook, yarn over and draw through the remaining two loops on the crochet hook. You have now completed the first double crochet. We will do this 10 more times. 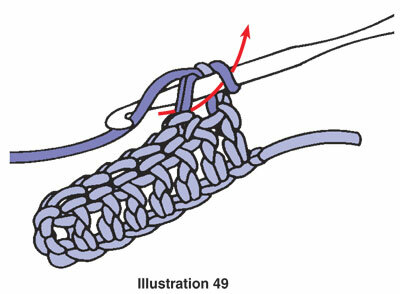 Insert the crochet hook into the third chain of the beginning chain 3 (see illustration 52). Yarn over and draw it through the chain and through the loop on the hook; you have now joined the round of double crochets.